Contrary to the glamour and pomp associated with the Oscars, the Collection of Awards Ephemera (Collection 209) tells a different tale about the event. Within it are mementos from ceremonies dating from 1939 to 2000 revealing that attendance could be real work. There are copies of the voting rules and eligibility criteria; a calendar guide to local theaters’ screening times of nominated pictures; innumerable press releases, as well as direct appeals to Academy voters. And although formal attire was always a requirement, ticket stubs in the collection show that seats were initially inexpensive; for example, in 1953 a seat in the 27th row set you back just $12.00. The glossy programs were work product for journalists who covered the event. Marginalia captures the routine listing of who-wore-what, a running score-card of the winners, as well as more critical observations. 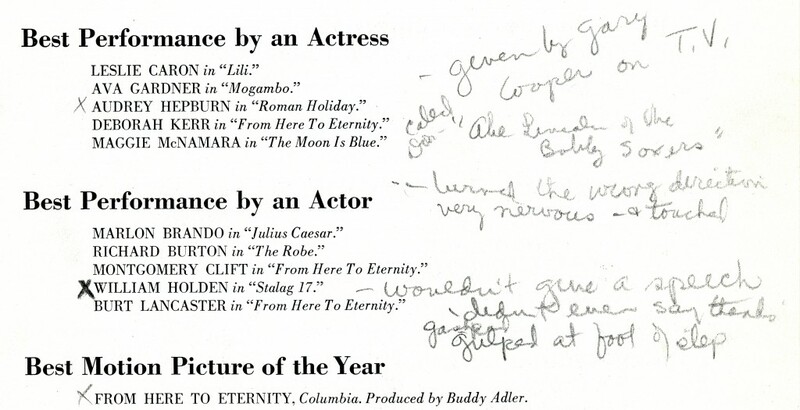 In 1953, the journalist who used this program noted that William Holden not only didn’t make a speech after his Best Actor win but failed to even thank the Academy for his honor. This collection combines keepsakes from several sources into one collection. Working or not, these items were important mementos to their former owners. These tokens speak to the extraordinary power of Oscar in our collective imagination.